Re-blogging my own blog: Lost the plot! This is the first time I’ve re-blogged one of my own blogs, but one of my new readers who I happened to meet in person asked me to think about re-blogging some of the posts I felt new readers might enjoy. After blogging almost daily for over three years, even using the Search box, it might be a challenge to find stories such as the one below. Although it is NOT a joke, it fits in with the Tuesday humour theme I used to apply. Jodi moved on to another job, and my carer Tess who took her place I am sure will get a laugh from it as well! My friend and carer Jodi made me promise to tell this story. It is definitely a story I am glad to have remembered, a good one for my children to have later on, and it highlights well a little of who I am! I am a little nervous about it as there are people out there, who were instrumental in me losing the plot, who may not know how I feel about having lost the plot, but there you go, I’ve decided I’m feeling brave and it is time to share! I have been told by Jodi and others I am weird, that I must have been a weird teenager, a weird 18 year old, and, still like weird music. I’m okay with that, as to me, weird just means different. Yes, going against the flow, not being a sheep and following others, being brave and courageous enough to go my own way. So, weird or different, it is often just Jonathon Livingstone Seagull and me. When I was in my 17th year, it seemed important to me to find a plot for when I died. I was into family, and felt it would be nice to be buried in the cemetery at a place called Lipson in South Australia amongst my mother’s side of the family. My eldest aunt was also thinking about this as her husband had been a soldier, and they could not be buried together. We decided it would be nice to get a plot next to each other, and next to her father, my grandfather. When he heard about this, he was so thrilled he bought the 50 year lease on each plot for us, mine in time for my 18th birthday. Now, I did not think this was weird or strange or anything out of the normal, then, or now, but Jodi and my husband tell me otherwise! It was, and is, and I am weird… they say! A few years ago, I received a random phone call from my mother, asking me if I still wanted my plot. Of course I said, that is why I wanted to buy it in the first place. When I asked why, it was mentioned an elderly uncle of hers, a great uncle of mine, wanted it. Now, to me, that was weird. Someone wanting my plot! Why not a plot near by, or next door, or in the next row? The cemetery is quite small, and there is no way we’d get lost amongst the rows of headstones. The calls went back and forth for some time, and each time I said, No, I don’t want to give away my plot, I still want to be buried there. My husband was even called, to see if he could talk me into giving up my plot. Eventually the requests stopped, and I completely forgot about the possible takeover of my plot. Sometime later the question happened again. It was my father, casually asking me if I still wanted my plot. After some discussion, and my inability to say no to him back then (which is I’m sure why HE called), I said, Ok, I give in, Uncle can have my plot. I called the appropriate Council Chambers, typed up and printed off the letter of transfer, and faxed it over. Done and dusted, I had lost my plot. Not a phone call or letter of acknowledgement or of appreciation. It wasn’t transferred with great expectations, but the basics of common courtesy would have been accepted. I wondered if the weirdness of wanting someone else’s plot was the reason for the silence? My aunt and I felt quite despondent we eventually would not be beside each other for an occasional chat! Strangely, it took me quite some time recover from the strange and vague grief I felt in letting go of this plot. After I had shared this story with Jodi, she laughed so hard she cried, she bellowed and guffawed as she repeatedly told me how weird I must have been. When being interviewed about me recently, she told the director of the documentary film crew that I was slightly weird, and listened to weird music! Obviously we have a relationship that thrives on that level of humour and honesty! We laughed together, we cried tears and held our sides together from the pain of our hilarious laughter, and on the way out to her car, we kept ranting I’ve lost the plot as we laughed. She has since told me the losing the plot story made her day. 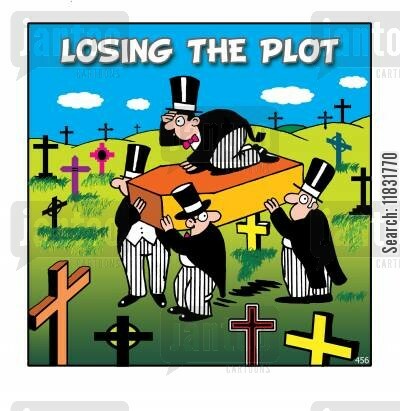 Now what is weirder, me having had a plot, someone wanting my plot, or me losing the plot??!! First published by Kate Swaffer on 4 December 2011.